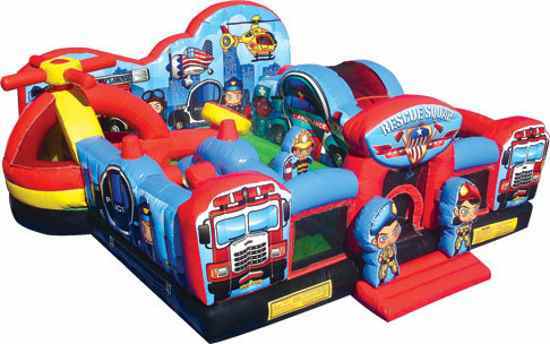 The Rescue Squad is an amazing inflatable pre school playground for little heroes and heroines. This inflatable game has a rescue worker theme, including depictions of police, fire and emergency service workers and their vehicles. 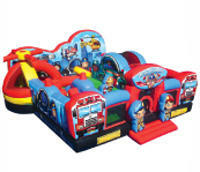 This unique inflatable playground features a fun three-dimensional ambulance climb and slide, a 3-D police cruiser with pop up obstacles and adorable 3-D fireman and nurse pop ups. An oversized rescue helicopter completes this detailed rescue worker theme, along with rescue-themed artwork on both the interior and exterior walls.